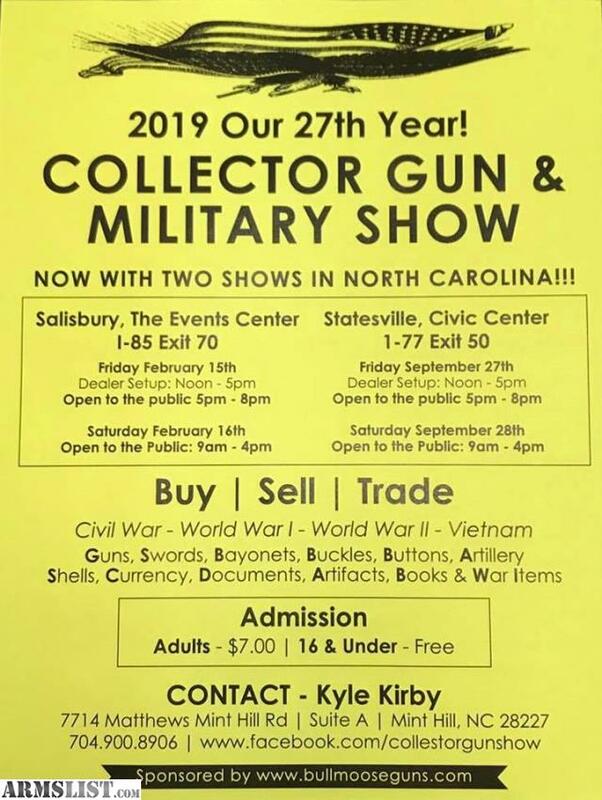 In 2019 North Carolina’s absolute best military and collector show will be returning for the 27th year, but this time we’re doubling down! We’ll be having our first show at the Salisbury Events Center on February 15-16, and our second will be at the Statesville Civic Center on September 27-28. Both shows will have dealer set up from noon to 5PM on Friday, and we will be open to the public after that until 8PM. On Saturday we will be open from 9AM until 4PM. Tickets are $7 per person at the door, and any supervised children 16 or under will be admitted free of charge. We still have space available at both shows for additional dealers. If you would like to set up a table please contact us at 704-900-8906. Tables are $60 each. Please ensure that all items are military related. We’re expecting well over 100 tables per show, each absolutely filled with military gear, surplus guns, and hard to find militaria. Whether you want to add to your collection, are looking to downsize, or just want to look at some incredible pieces of military history, this show is sure to have what you're looking for!